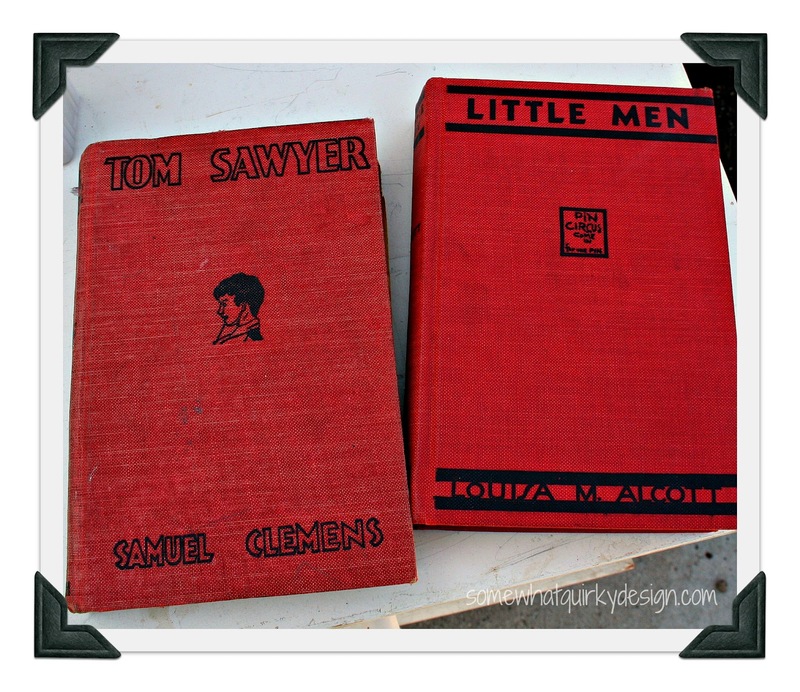 Somewhat Quirky: Estate Sale Season is Here! Estate Sale Season is Here! Estate and garage sale season is finally here in Michigan. I have to be careful during this season because I have limited funds and in all honesty I don't NEED anything. Most weekends I skip sales all together. Occasionally though I just feel like having a day out at the sales. Friday was one of those days. Since my funds are limited and my eyes are bigger than my funds in most cases, I try to have some strict loose guidelines: affordable (translation - cash in my pocket), immediately usable (translation - will not add to any of my stashes), or a significant contribution to an existing vision (translation - something on my pin board). First I hit up another Artful Solutions estate sale. It was day 2 - so that means everything was 20% off. Not as good as the 50% I could save if I waited one more day, but I was booked for Saturday and this was my only chance. I found this chest for $5.00. Perfect for a project I have planned for my patio. I'm already halfway through the transformation - to be disclosed at a later date! Ever since I had to take 3 inches off of the kitchen cabinet where I sore my herbs and spices I've been trying to come up with a creative herb management solution. I'm hoping these will help. I was totally charmed by these jars. Too expensive, but I've never seen anything like them before. I know I will use them. The set ended up being about $25 with the 20% discount. A splurge, but I think they are worth it. I couldn't resist these two books. $3.20 each. Probably should not have bought them. At least they are my favorite color. I did a drive by to a few garage sales, only stopping at one. I love David Sedaris' books. I've only read one and they had a whole collection for $.50 each. A pretty good investment I think. The frame I bought because it is a deep set frame (don't know what those frames are really called - where there is about one inch between the glass and the mat). Frames like that are harder to find and this was $1. I'm pretty sure I can make something out of this in a matter of days weeks months - so I buy it. Maybe I should do a giveaway on the poodle picture....I think the response would be overwhelming! Don't you? I'm 3 blocks from my house and all my shopping urges are gone so I go home. Done for the day. Books are put away. Spice jars are filled. Chest is half completed. Only one piece added to stash. I love those spice jars! My goals for yard sales are similar to yours. Items to find this past weekend included a kangaroo, guitar, and tank tops for my granddaughter. I found the first two, but no tank tops. Good for you for sticking to your limits. I agree...those spice jars are fabulous! I think it was a fair price, and I would have been tempted to snap them up, too! Can't wait to see the chest reveal along with your patio. And yeah, those spice jars were worth it. Thanks for stopping by Quirky Vistas and reminding me to keep the Quirky alive. I laughed out loud. I really like those spice jars. It looks like you had a wonderful productive day! Can't wait to see the finished project! I think that frame is a shadow box, isn't it? Good job and such self control. 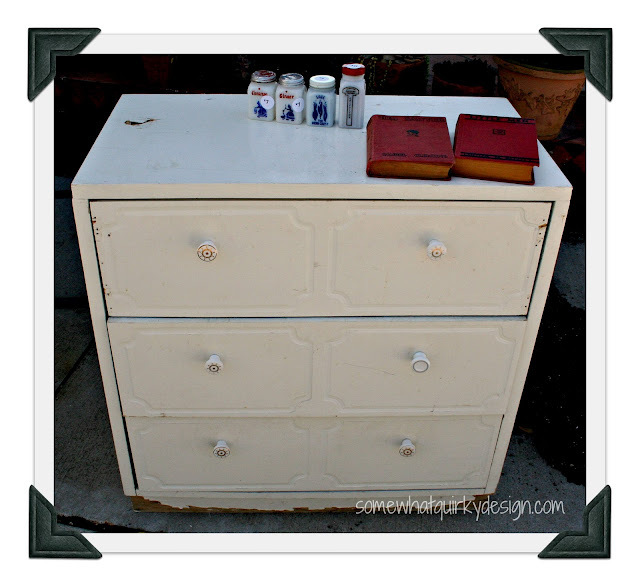 The dresser was a great find at $5. If I have to drive by a sale that looks good it bothers me all darn day wondering what I missed. Great spice jars, and they are quite collectible! Poodle picture is sweet too. Love everything. Visiting from Knick of Time. Love those spice jars....you did good. It is hard to pass up a good garage sale! Oh how I wish I had your discipline and control! Maybe I need to adopt your rules - then my garage won't look like a crazy hoarder lives there! 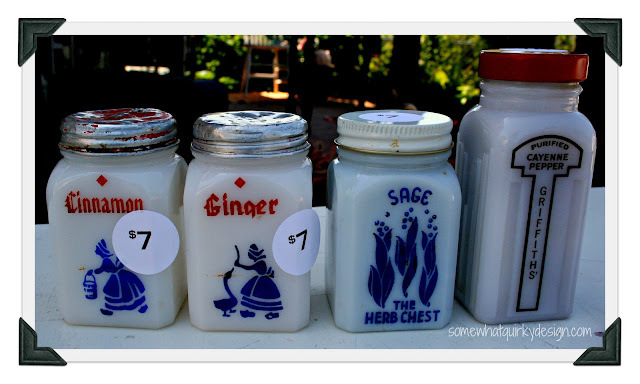 I actually just scored an 11 piece set of the Griffith's milk glass spice jars (the one on the far right in your pic) from a yard sale. Got them, 2 lamps, a chest, old typewriter and mid century pot for --- $20!! Gotta love a day like that! Good job Karen is right!!! Those spice jars are so awesome and I bet your dresser makeover is coming along great!! 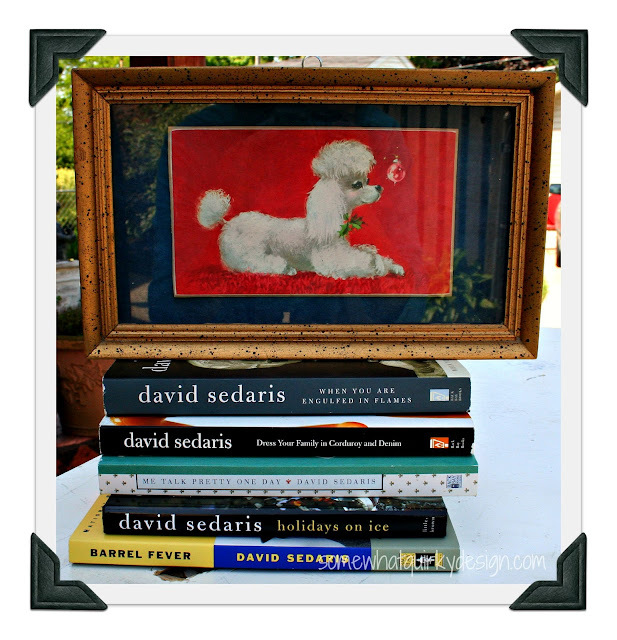 I adore, adore, adore David Sedaris! He is laugh-out-loud funny! When I read his books my husband thinks I'm insane because I just guffaw like a mad woman!